Caption slip reads: "Photographer: Snow. Date: 1954-04-17. Reporter: Adler. Assignment: Boy lost. 7887: Culver City Fire Capt. R.E. Wilson on walkie-talkie during dragging of Ballona Creek. 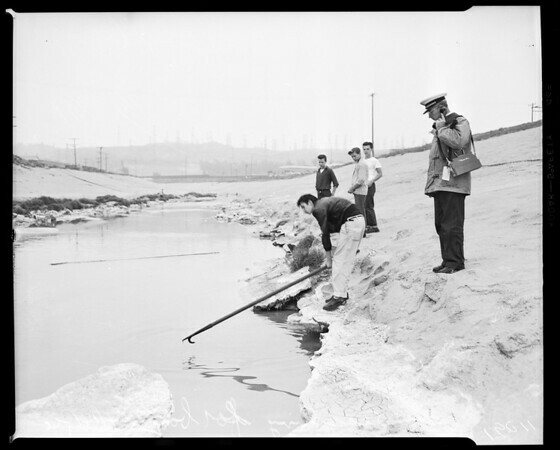 77: Fireman Glenn Ebert dragging Ballona Creek. 88: Long shot of dragging operations from Overland Ave. bridge. Louis Karney, father, holding Jules Karney, 8, in reunion minutes after boy was found. 83: Juvenile Sgt. Ron Perkins talking with Jules Karney, 8. Mrs. Pauline Karney, mother, breaks down as reunited with Jules Karney, 8".